About 3,000 armored vehicles 1990-2016. In 1990, with the fall of the Berlin wall, dislocation of the Warsaw Pact and the fall of USSR, France found itself out of the cold war. The Army faced in a new context where, like other European Nations, budget cuts are mandatory. Major upgrades and new programmes were never forgotten though, and most 1970-80 generation AFVs are already replaced or to the point to be replaced. The latest current program (2014) is the VBLM, scheduled for service in 2020. In addition, a cold war programme started in the early 1980s was never to be ousted by the budget, as it was too important to miss. Find a viable successor the old AMX-30 (designed in the early 1960s), and third-generation main battle tank. This programme led to building the AMX-32 (1982) technology demonstrator and in 1984-85 the AMX-40. None hit the export market, but they were precious in the development of the future platform. Protection was paramount, contrary to the previous tanks, but still mobility was chosen as the key factor. Gunnery was also improved due to the new long barrel 120 mm smoothbore adopted on the Leclerc. Although much heavier than previous designs it was nonetheless compact enough to have one of the best power-to-weight of its day, which traduced in breakneck speeds. Other interesting and innovative aspects in design were the modular approach of the armour and smoke dischargers. Production was started in 1990 and after several initial series the whole production ended in 2008 after 862 delivered by GIAT, almost half of which were for the Saudi Arabian Army. The deal of the Saudi order signed early on was by the way paramount to finance the whole development on its early stage. 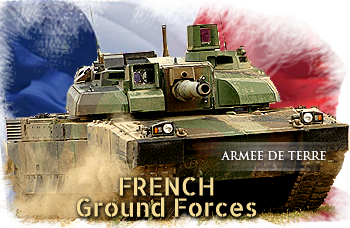 The Leclerc is now France main battle tank at least until 2030, but upgrade programs are currently applied to the earliest series. Contrary to other European MBTs, the Leclerc was never really tested in combat, and only knew UN missions in Bosnia. 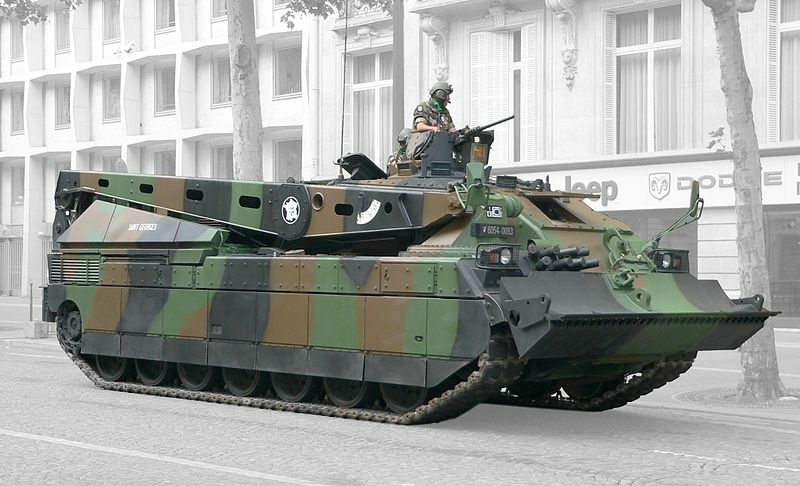 By revealing the VBCI (Véhicule Blindé de Combat d’Infanterie) in 2006, France showed it was too influenced by the Mowag Piranha concept of a relatively large wheeled platform (8×8) and an extreme internal modularity. It started as a joint project with Germany and Italy but France later retired due to unwanted technology transfers and political reasons. It was amphibious, NBC protected and air-transportable (in the new Airbus A400M scheduled to replace both the Transall and Hercules still in service). It was indeed modular enough to be declined in at least three major variants, the APC (VTT), IFV (VCI) and command vehicle (VPC), and replaced in effect the tracked AMX-10P. 600+ were in order and now has been delivered. However, the large fleet of APCs is still made of 3000+ Renault VABs, declined into many variants in 4×4 and 6×6 chassis. Conceived in the 1970s, these were gradually retired or modernized into the “Valo” or “VAB Valorisé”, VAB NG, and VAB Mark II which is the final upgrade (2010). Improvements are mostly aimed at the armor (better against 12.7 mm projectiles, and mine-blast protection). VBL in Afghanistan. This light recce vehicle was mass-produced after the end of the cold war and had some success in the export market. Leclerc By some margin the crowning jewel of French Armour in the 1990s, the Leclerc was produced both for Saudi Arabia and the French Army, which retains about 180 in active service now. AMX-30B2 Only 17 “BRENUS” remains in service, in their modernized and up-armored version with ERA. They are in the process to be play as FORAD (enemy tanks) in exercises. 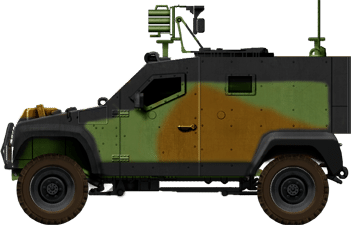 VBCI The modern 8×8 APC/IFV/Command vehicle of the French Army. Nearly all of the 630 in orders were received. VAB The main wheeled standard APC (a 1970s design). Of 3135 built, and many revalorized and upgraded (third generation), the oldest are scheduled for retirement in 2020 when the new VBLM will be available in numbers (2080 are expected). AMX-10 RC (1981) This wheeled tank/armored recce vehicle is to be replaced by the future EBRC Jaguar in 2020. 248 vehicles are planned to replace the same number of AMX-10 RCs. Also 100 of the ageing Panhard ERC-90 Sagaie (1979) wheeled recce tanks are also to be retired but so far no schedule has been given. Alongside these, 28 Renault VBC-90 (1985) are still used by the Gendarmerie. 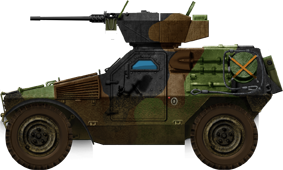 Panhard VBL (1990) The nimble VBL is the standard light recce vehicle of the French Army, fully enclosed and modular. So far 1470 ar in service. PVP (2002) For “Petit Vehicule Protégé” litt. small protected vehicle. Built by the successor of Panhard Auverland, to 1180 vehicles so far. Nexter Aravis (2009) A relatively small MPRAP by generic standards. So far only 15 had been ordered by the French Forces (for operations in Afghanistan) but Saudi Arabia ordered 100, and 12 by Gabon. Alongside these the French Army previously loaned US Buffalo MRAPs. Leclerc DCL (2004) The new standard ARV, of which 16 are in service. Alongside these are still 58 AMX-30D ARVs and 42 EBG (CEVs). Self-Propelled Artillery Is still represented by the AuF1 155 mm SPG variant of the AMX-30 now dating back from the late 1970s and pending replacement, and the much cheaper, unarmoured but effective CAESAR (pic.) SP howitzers using a 155 mm/52-calibre using augmented ammunitions for a 50 km range. 72 are in service in the French Army, based on Renault Sherpa 10 chassis whereas the export versions use an Unimog 6×6 chassis.